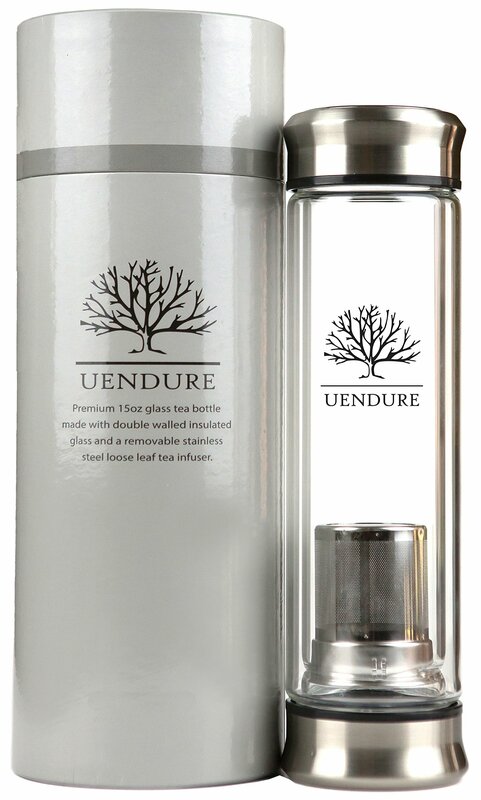 Home › Home and Kitchen › Uendure Tea Infuser Glass Tumbler With Loose Leaf Tea Strainer Tea Cup With S..
Uendure Tea Infuser Glass Tumbler With Loose Leaf Tea Strainer Tea Cup With S..
GLASS DESIGN - Double walled insulated glass tumbler keeps hot drinks warm for up to 90 minutes. SIMPLE TO USE - Contains two "twist off" lids and a strainer that snaps into the bottom of the bottle. HEALTHY CHOICE - Your tea only contacts lead free glass and food grade stainless steel. Drink smart! LOOSE TEA & MORE - Perfect travel mug for tea, coffee, infused fruit, smoothies and essential oils. EASY TO CLEAN - The two open ends make for simple cleaning and allows air flow for natural drying. OUR TEA INFUSER BOTTLES ARE FINALLY HERE ON AMAZON.COM A premium tea infuser bottle made from natural, eco-friendly materials. Our bottle is uniquely designed compared to the multitudes of identical bamboolid bottles on the market. First, ours is made of high quality borosilicate quartz. It's a double walledinsulated glass that maintains the temperature of your beverage and fitscomfortably in the grip of your hand. Second, it's designed with two openingsand two brushed metal lids, which provides a modern feel and simple access forcleaning and drying. Third, our food grade stainless steel tea infuser isplaced at the bottom of the bottle and doesn't interfere with drinking. It canbe left in place for less bitter teas, or easily removed to prevent from oversteeping. Fourth, our bottle comes in elegant packaging designed to impress.Our high quality tube box is similar to what you would find when buying aquality scotch or bourbon. How to use our bottle? Simply remove the bottom lid and lightly push the infuser into the bottleuntil it snaps in place. Fill the infuser with your favorite type of loose teaand place the bottom lid back on the bottle. Remove the top lid and fill thebottle with hot water. Place the top lid back on the bottle and watch your teasteep to perfection. Our philosophy We believe in "100% Guaranteed". It represents both our philosophy of sharingthe best of times with our loyal customers and our promise to deliver apremium tea infuser bottle to you, your family and your friends. We prideourselves on customer service and will do whatever it takes to make you happy.